Last night I went to buy groceries, even though I didn’t really have time to stop and buy groceries, but you know, a girl’s gotta eat. It had been a day at the races, a day with my nose to the grindstone, getting stuff done, meeting deadlines, time running out. When I got home and opened the car door, I was blasted by the sound of hundreds of blackbirds in the tree at the end of the driveway. I could barely see them, they managed to blend in quite well with the leaves on the tree, but I couldn’t possibly miss their raucous party sounds. And so, I stopped rushing. After a few moments of standing there, grinning like a fool, I closed the car door and they all flew from the tree out front to the tree out back. By the time I carried all the groceries in and my camera back out, they were moving on down the road. This entry was posted on Thursday, September 5th, 2013 at 9:00 amand is filed under . You can follow any responses to this entry through the RSS 2.0 feed. You can leave a response, or trackback from your own site. Once again, a terrific vignette. Nice work. Kelly this is such a great reminder to us all, and what a beautiful capture. I love when nature choses to remind us to slow down to pause, to pay attention amidst the craziness. 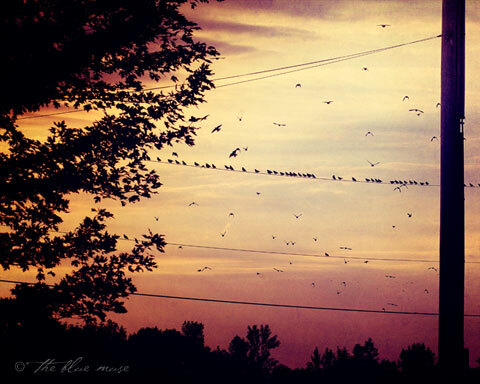 Nothing like the symphony of the birdies before they realize you’re listening. Wonderful. This was a perfect reminder. Thanks.